My Comrades, it is the hour of eleven. This pause is to remind us that the hour of eleven has tender significance to every member of the American Legion for. It was on the eleventh day of the eleventh month at the eleventh hour that the guns of World War I ceased firing. Silence encompassed the earth. It was at eleven that the last man died in battle. It was at eleven that a delirium of joy and thanksgiving swept over a grateful humanity. It was right then that the soul of the American Legion was born. It was then that our obligation to our country and to her honored dead was conceived. Since that time we have been victorious in a second and more devasting war. But could will our jubilation forget the thousands of our Comrades who gave their lives to gain that victory or can we here tonight be unmindful of our boys who fought, suffered, yes died in that wildness called Korea. The rest of article was not found. Each year at about this time, we of the St. Stanislaus Memorial Post 1771, American Legion and our Auxiliary unit put aside our own trials and tribulation of every day living to remember lovingly those of our comrades who have preceded us in crossing the Great Divide. We do this each year to show the good people of this parish and community that the honored dead of this area have not been forgotten. We also honor our own post members who have died since the end of the war. We deem this a fitting gesture and we ask all the people to join us in this solemn occasion. You can do this by displaying your flags on this Sunday and by remembering these heroes in your prayers. The freedom that we enjoy today in this great, country of ours did not come about easily. They were ‘gained for us by such men as, these who fought and died so that no foreign aggressor would invade our shores to impose his will on us. Let us be ever thankful and let us never forget that they died to insure our freedom. Let us also forever be on the alert that no one in the future will ever be able to impose 011 us a way of living that these men fought to avert. Right now, just a menace exists in the form of Communism. They will try to do anything within their power to convert us to their way of thinking. Don’t let them. You must fight them with the same propaganda weapon that they are constantly using against us. Express your love for your country every chance you get and fight for the principles of democracy. In this way, Communism will never be able tip gain a foothold in our country. These honored dead must never be made to feel that they have died in vain. On behalf of my post and our Ladies Auxiliary, our Sons of the American Legion and our Junior Auxiliary, I want to thank the Rev. Father Hladiki and his priests for the wonderful cooperation they have given us in making it possible to observe our twelfth Annual Memorial Mass. A triangle of land at Oakland Street and Driggs Avenue has been officially designated Father Studzinski square. A city council bill creating the square, was signed by the Mayor last Friday. The square was named for the late Rev. Joseph Studzinski, C.M., pastor of St. Stanislaus Kostka Roman Catholic Church for 19 years, from 1935 to 1954. The bill was passed by the, City Council. May 18 after it if was introduced by Vice-Chairman Joseph T. Sharkey with the approval of Rudolph Zimmerman and Mrs. Ethel Walsh, leader and co-leader, respectively, of the 14th Assembly District. Action to name the square after the former pastor was initiated by St. Stanislaus Memorial Post, American Legion. Born IN 1887 in Silesia, Poland, Father Studzinski was ordained a priest on July 2, 1191. He was 18 years old when he joined the Vincentian Congregation in Krakow. Coming to the United States shortly after his ordination Father Studzinski was assigned various Polish-American parishes and was rector of St. John Kanty Preparatory School 1929 – 1934. After a year of mission work he was appointed pastor of St. Stanislaus Kostka in 1935. As Pastor of the church, he was responsible for beautifying it, building and modernizing its facilities and organizing the church’s societies. In addition, he was personally concerned with the welfare of his parishioners and especially interested in the education of the children. It was also through his efforts that “The Patron,” first a monthly and then a weekly, was established as the publication of the church and it’s societies. During World War II, a Red Cross chapter was established under his direction at the church. Father Studzinski has also has been credited by St Stanislaus Memorial Post with assistance in helping with its formation during its formative years. It was this, among other works the beloved priest left behind, that prompted this post’s proposal first voiced by Past Commander Nicholas Stefannizzi. Stefannizzi headed a committee of the post that brought the matter to the attention of elected officials. 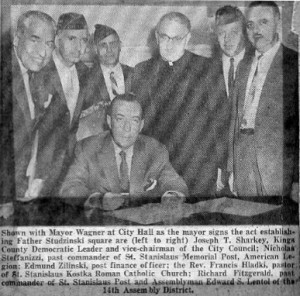 Other members of the committee were Richard Fitzgerald, Henry Woloski, Peter Rago, John Brady, Joseph Rash, John Kase, Walter Korcz, Leonard Wasniewski, Edward Kozak and Henry Bulakowski.